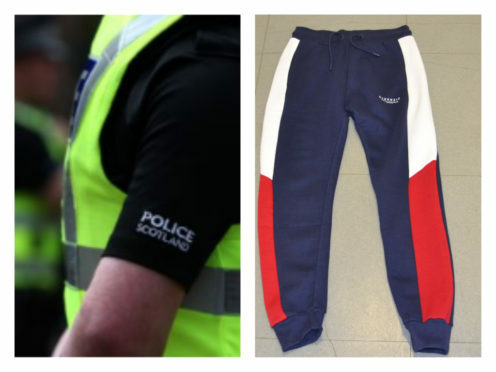 Police released the image of the trousers in the hope they may be recognisable to anyone who was in the area around that time. Police have renewed their appeal for information following an indecent assault in Inverness earlier this month. A young woman in her teens was attacked at 10.50pm on March 10 near to the Merkinch Community Centre, Coronation Park. Officers are trying to find a man who was seen in the area at the time who may be able to assist with their investigation. Today, the force released an image of a pair of Mackenzie-branded navy jogging trousers with a red and white band, pictured above, which are believed to be similar to the ones the man was wearing. He is described as being in his late teens, of slim build and standing about 5ft 5in to 5ft 7in in height. He was also wearing dark plimsoll style shoes. Detective Constable Gary Hines said: “We would like to thank the public for their assistance so far we would urge anyone with any information that could assist with this enquiry to contact police as soon as possible. “We have released the image of this pair of trousers in the hope they may be recognisable to anyone who was in the area around that time.